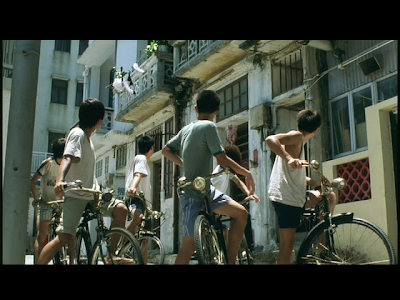 Just one look directed by Riley Yip Kam Hung is set in 1970's Cheung Chau, a small island off Hong Kong, this location is perfect for Yip's coming of age story, infused with film love and nostalgia. Fan (Shawn Yue) blames local gangster Crazy (Anthony Wong) for killing his father (Sam Lee), who died in the local cinema toilet while Fan was there watching a movie as a boy. During the next ten years Fan is determined to seek revenge but is too scared to confront Crazy. More stuff happens involving girls (Charlene Choi and Gillian Chung aka Twins), Fan's best friend Fishball Ming (Wong Yau Nam), movies and more. Just one look is a film where a synopsis cannot do justice to the actual film, much happens that is of little consequence, either in terms of narrative or meaning, yet everything feels in the right place and time. Yip has a real talent for this kind of balancing act, where feel is more important than plot and atmosphere more so than pace. Yip's earlier movie Metade Fumaca, while different narratively left me with a similar feeling to this and I would highly recommend that movie too. Using the fantastic Cheung Chau locations, Riley Yip has crafted a sleepy paced little movie, using humour and pathos to wonderful effect. The film draws us in to our own pasts, making little things that happen recognisable from our own lives, even those of us half a world away from Cheung Chau. This is the key to falling for the film, wallowing in the nostalgic mood it so successfully creates, taking you back to being on the edge of adulthood but still far enough away from the reality of it. This is particularly true for fans of cinema and even more so for fans of Chinese cinema (which we all are, right?) From using the cinema billboards as part of the storytelling to more obviously inserting the characters into the films themselves in fantasy sequences, the movie plays on how we used to feel as film viewers longing to be in the film worlds on screen. Shawn Yue carries the lead role of Fan very well, but really the film belongs to the supporting cast, Wong Yau Nam is excellent as Fan's best friend and the two of them have some really good chemistry together. The Twins do pretty well too, Charlene is good but is a little sidelined, and Gillian pulls off a difficult role very well considering she isn't given very much to work with. 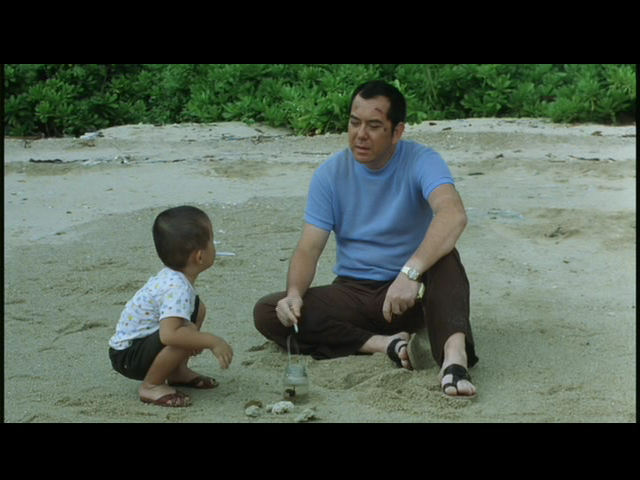 Sam Lee is fun in his little cameo and Eric Kot is very funny as the Kung fu master, however the best performance in Just one look is Anthony Wong's. Another in a long line of fantastic characters he has delivered over the years, Crazy is alternately hilarious and touching, especially the scene on the beach with his son. I really don't think I can (or want to) fault Just one look, it successfully achieves everything it sets out to do and left me with a lovely warm feeling inside, without being cloying, and that is something thats difficult to do. Hmmmm...I dont know, any films with the Twins involved tend to deter me from watching it. Their acting "ability" matches their "singing" ability, if you know what I mean. Still, after that whole "Edison" saga with Gillian, I do feel a tinge of sympathy for them. And Cheung Chau is a nice locale, a laid-back sleepy outlying island (like Lamma Island)away from the hectic pace and modern life of Hong Kong. Hmmm...I don't know. Any film starring the Twins tend to deter me from watching it. Their acting "ability" matches their "signing" ability, if you know what I mean. Still, I do feel somewhat sympathetic to them after that whole "Edison" saga. Should I give this film a look? You should absolutely check it out, the twins are fine here and they aren't the centre of attention anyway. I can see why you might think that given the advertising for the movie, but it's not that way at all. I love "Just One Look" and think it is a charming gem of a movie. However I have to admit that I haven't dared to view it post the whole Edison Chen affair (although I suppose I could think of Gillian Chung's involvement in that scandal as adding fuel to the idea that she really is a very good actress after all...). BTW, A Hero Never Dies, have you seen this old post of mine about the old cinema in "Just One Look"? I completely agree YTSL, charming is a really good way to describe the movie. Thanks for the link too, I hadn't seen that post and its really cheered me up after a pretty bad day! Well so long as this film is better then the "Twins Effect" (I threw up watching it), I am willing to give this film a shot. Trust me, its better than the Twins effect movie! Nice work, good sir! A great little review of a great little film. It's a pity Riley Yip didn't direct more films, as Lavender and Metade Fumaca were of similar excellence. 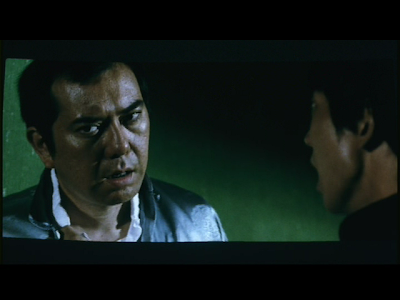 Btw, Metade Fumaca is now part of the Fortune Star library so maybe we might see a Bluray re-release eventually? Thanks Mike, I haven't seen Lavender, I'll have to track it down. Metade fumaca would make a great blu ray, I don't think Shu Qi has ever looked better to my eyes! I don't mind the Twins as far as acting goes at least, I do think they have something to offer (although I can see why Twins effect upset people. I do really like Miriam Yeung, she's very underrated.